Currently due to the high volume of orders, delivery of your pond liner will be 5 to 7 working days. Pond liners are supplied either as standard size kits or in custom sizes. Both are available in a choice of PVC or more durable Butyl and Epalyn (EPDM = ethylene propylene diene monomer) rubber pond liners. Our standard size pond liner kit includes a pre-cut pond liner plus protective underlay. The pond liner kits are more cost effective versus buying each item separately. For custom designed ponds we have an interactive pond liner size calculator on our website to work-out the exact pond liner dimensions you require. Epalyn (EPDM) and Butyl rubber pond liners guarantee low maintenance water retention provided they are installed with a protective underlay liner. Epalyn and Butyl can also be fabricated into box-welded or tailored-to-fit pond liners for formal ponds. Other products supplied include Geotextile protective underlay, pond pumps, garden solar lights, rainwater butts, portable greenhouse and other accessories. A black synthetic rubber sheet. The 1.0mm is ideal for more demanding applications. 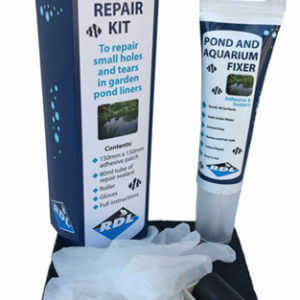 The premium pond liner repair kit contains all you need to get the job done to a professional standard. Recommended for all pond liner installations. Offers tough rot resistant protection. Orders must be a minimum of 2 meters in width.